I don't know if I even want to call this a recipe. I almost didn't post this because of the simplicity. 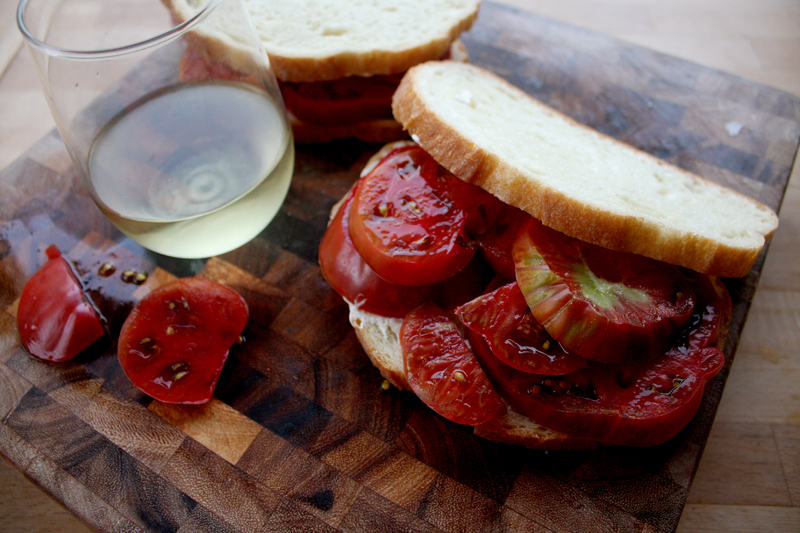 But, this is a sandwich that the husband and I look forward to each summer, with the bounty of Purple Cherokee tomatoes that I've obsessively planted for the past few summers. The tasty juice is incomparable to other varieties, and the touch of salt just seals the deal. I was comforted re-watching an episode on PBS - we don't do cable, just imagine the bunny ears - with Chef Vivian Howard. Her understated, real North Carolina charm is addictive to watch, but we became kindred spirits when she talked about the soft spot she has for the tomato sandwich, on plain white bread, that she ate growing up as a kid. I used to eat tomatoes sprinkled with a little bit of salt growing up. It wasn't the Korean side that so strongly represents who I am today. It's the other half of me that's southern, now faint as I've grown up into a Northwest adult. But. I still can't pass up a humble tomato sandwich. Core and slice tomatoes about a ¼" in width. 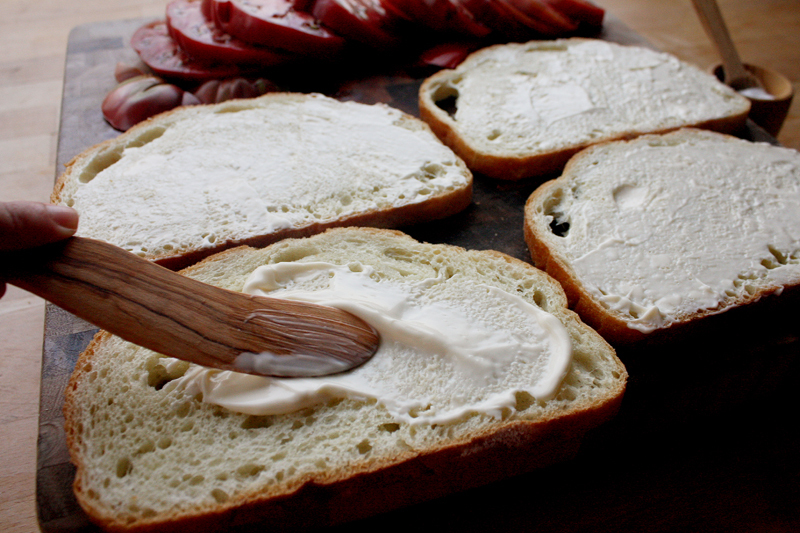 Slather on as much mayo as you'd like on both slices of bread. 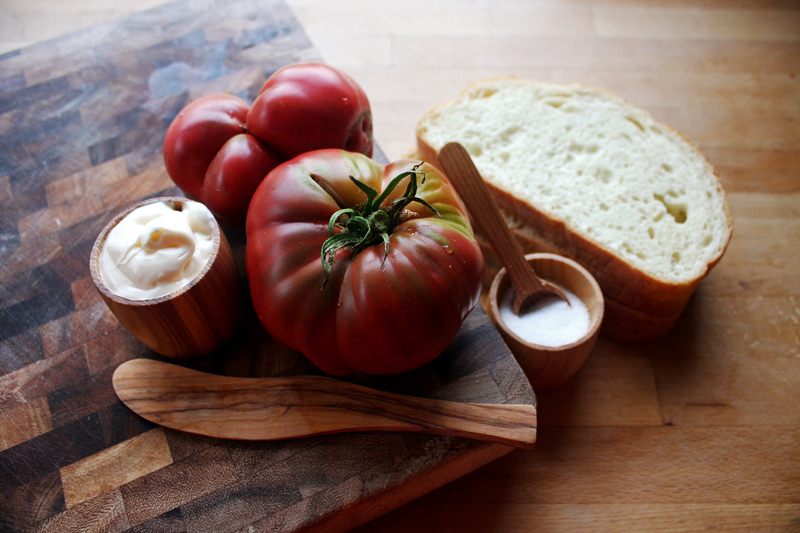 Sprinkle on salt on the top layer of the tomatoes. Note: Obviously, the measurements are quite ... creative, but this is how I used to share recipes. With a lot of imagination :) I thought it belonged in this post.